If you’re looking for reliable shipping to Turkey, look no further than DPD Local Online. 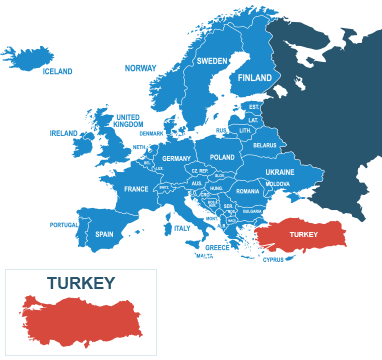 With our extensive experience in international parcel post, as well as our trusted European courier delivery network, we can help you arrange fast and affordable postage to Turkey with none of the hassle. Sending a parcel to Turkey is easy with DPD Local Online. With our express and economy courier delivery services at your fingertips; just fill in our easy-to-use online form, book your parcel service and we’ll take it from there. A thriving place for not only tourism but local and international business too, Turkey is a beautiful country packed with cultural heritage. Whether you’re sending a parcel to the cities of Ankara or Istanbul, or even to tourist havens such as Bodrum, Fethiye, Antalya or Marmaris, you can trust us to get your parcel to Turkey quickly and with the best possible quality of service. So, to arrange your shipping to Turkey, book with DPD Local Online today. Do I need to deal with customs when sending from the UK to Turkey? There’s no need to worry about customs duties when posting to Turkey from the UK. That’s because although it isn’t a member of the European Union, Turkey does qualify as a part of the EU Customs Union, which dictates that no customs are levied on goods travelling between member countries, making shipping to Turkey even easier for you. How much does it cost to send a parcel from the UK to Turkey? We work hard to ensure that postage to Turkey is priced as low as £27.30 when you book through DPDLocal-Online. And not only are our prices low to Turkey, they're low to other EU destinations too! How should I address my parcel for delivery to Turkey? Turkish addresses do include a forward slash between the locality and the province names on the second-to-last line, which is a little unusual for postal addresses. If that sound’s confusing, don’t worry — you can refer to this handy addressing guide issued by the Universal Postal Union for help. For more information about goods you can and can’t send to Turkey, check with HM Revenue and Customs. See also our prohibited items page for a list of goods that can’t be sent with our couriers.